little patience to work with code. we'll try to work on few API such as Notification API,Location API,Offline Storage API and with Server Sent Events. Notification plays vital part in showing new information received to the corresponding service and showing to the end users.you would have experienced this when you get an email notification when you work in desktop and getting chat notifications while working with other tabs. from the above snippet we have written as function for notification handling,in which it requires users permission to send notification,So we are just requesting the user for the Permission as soon as user gives away the permission and callback function is invoked for making further actions.Note that always check for the permission before sending the notification and send only legit/reasonable notification because it may irritate users on seeing more notifications.And perform a check over the browser supports notification API in advance as initialization and perform the other related tasks. Location is another aspect for developers to choose languages,localtime or even advertisements and stats of the website may be useful for future purpose(Business decisions) and knowing about the website users geolocation. (As far i had seen). With this powerful API in HTML5 we could easily use the database on front end client side and making the load time and process time easier on server side.For example,When you look like application facebook,G+ posts can be saved locally in database (offline storage) and can be updated when they are connected to the network next time.this will really increase the loading time and rendering time minimum.instead of requesting the server for the whole newsfeed contents. This support storing object,create,update and delete like relational Database and have a look at it here. Before HTML5 there was a big story behind this,have a read.So we are in the age of good developed and matured API. So from the above code you can utilize the localstorage as key pair value and retrieved using the key from the storage.this is mostly used among the web developers,However try to use the indexed DB for complex apps and solve a loading time and increasing the productivity. 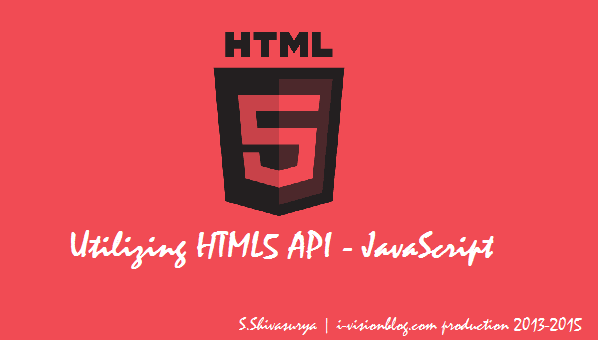 See the Pen HTML5 API - i-visionblog by s.shivasurya (@shivasurya) on CodePen. And thus we have seen few rich set API which can be used at appropriate need in web apps and enhance the user experience.However always check for support of the API on load itself and then invoke calls and respect the users behavior always and forcing them for permission and locking them this will be creating bad impressions. And there are still lot in HTML5 API such as detecting online/offline status,Canvas 2D drawing,animation,vibration API,full screen API,Audio & videos and WebRTC api for live webcam access and peer-to-peer communications. for Hugs/bugs/errors/enhancements just comment below or drop me a mail to s.shivasurya@gmail.com or chat with me in G+/facebook/Quora and do follow me in twitter/newsletter for regular updates.Share is care. feel free to post your comments! Don't Spam here!